This is almost a must read for anyone engaged in the sustainable innovation discussion. The material is a bit uneven and a few of the contributions should have been left out (low academic level and nothing really relevant to contribute), but overall it covers many interesting aspects of creativity. 1. What happens when successful creativity that delivers something good becomes a cage that makes it difficult to continue to be creative? 2. How can the educational system talk so much about creativity and do so much to kill it? 3. How close is creativity to madness? Liane Gabora and Nancy Holmes short chapter “Dangeling from a Tassel on Fabric of Socially Constructed Reality” is as poetic as it sounds. It makes me happy to see such a chapter included as this kind of texts are not often found outside the more “arty” fields. 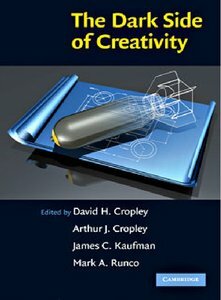 I would have seen a longer version of Arthur Cropley’s chapter “Creativity in the Classroom” where he developed more concrete ideas, and did this in relation to a situation where students will be connected and have access to ideas/input that no generation before have. In the chapter “The Dark Side of Creativity and How to Combat it” Robert Sternberg discuss what I think is the most important aspect, wisdom. It does not really say anything new, but the things we already know are sometimes the most important. I’m not sure why, but I think the chapter “Neurosis: The dark side of emotional creativity” by James Averill and Elma Nunley is my favourite. The way they use Dostoevsky, William James and Otto Rank to discuss creativity reminded me of Marsel Burman’s “All that is solid melts into air” and in all its lack of focus also brought back “Ideology” from Otto Rank that I have not been thinking about in a very long time. It is a joy to read books where the authors actually have spend time to think about the issue they write about. I hope that I can stay away from the “airplane literature” that is written by journalists as entertainment and with more focus on short nuggets that people can quote over the dinner table than any actual knowledge. I wonder if the “airport literature” are spread due to the fact that other journalists (with similar lack of deep knowledge) like them as these books are the kind of books they potentially could write (good in style but without much depth in knowledge). Are they the books equivalent of Fox-News/The daily show, entertaining at best and oversimplifying mainly? Hopefully the future will have more of these books where people with knowledge explore issues in depth.